Palestinian students in annexed East Jerusalem are receiving less than half of the funding of their Jewish counterparts, Haaretz has reported. The paper revealed, according to Al Ray, in a report published Tuesday, that, after sweeping the budget of Israeli municipality in Jerusalem, 11 secondary school Palestinians out of 17 do not receive its dedicated budget from the Israeli Ministry of Education. The Israeli municipality refuted the report, saying that Haaretz did not reflect the real facts, and manipulated the statics and data. 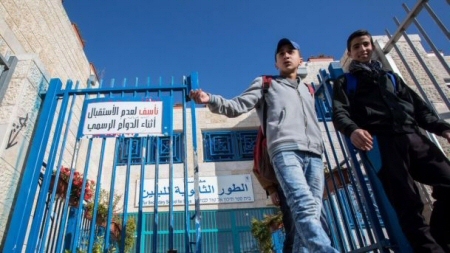 The report noted that the total number of Palestinian secondary schools in east Jerusalem is 17, and that they receive their budget from the Israeli municipality and Ministry of Education.